When it comes to Claire Cook’s books, I have this tendency to shut out the rest of the world from the minute I start page one, and I’m pretty much unable to do anything but read, read, read until I finish the last word. The voice, the characters and the plot are so engaging that no matter what time it is, I find myself saying, “one more chapter”—and then one more after that, and one more after that. 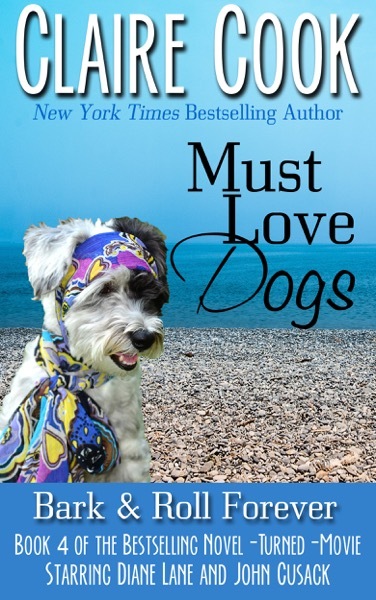 Her latest, Must Love Dogs: Bark and Roll Forever, is no exception. I devoured it, and now I’m craving another helping. Bark and Roll Forever, the fourth installment in the Must Love Dogs series, reconnects us with beloved heroine Sarah Hurlihy and her—zany? Quirky? How about just plain awesome?—family. This time around, Sarah and her boyfriend, John Anderson (who she is now just trying to think of as “John”), are taking their relationship to the next level by looking for a house together and trying to start a family. Of course, neither one comes easily, and on top of that Sarah must juggle family drama, her ex and his replacement wife popping up everywhere, and the massively intense experience of being a preschool teacher on Halloween. Oh, and her always-up-to-something father’s new business venture might be keeping her on her toes a bit as well—but she should be used to that by now. I absolutely adored this book. Claire Cook’s writing is so funny, fresh and sharp that you can’t help but fall in love with every single one of her characters. I feel like I know the Hurlihys deeply at this point—that I’ve been to every one of their Sunday dinners and that I’m privy to all of their family secrets and harmless sibling gossip. I’ve laughed with them, cried with them, and laughed until I cried all over again. Sarah is just the kind of protagonist I can always, always get behind. She’s smart, witty, a little harried and has a tendency to think about and notice things we all think about and notice but assume we’re alone on. (Plus, she’s got a heck of a spin on macaroni and cheese.) I will gladly follow Sarah through all of her adventures, and I can never wait to find out what’s going to happen next. I am so glad that Must Love Dogs has turned into a series, because even though I’m sad when each book ends, I know that there is another one coming. Which is perfect, because after the last paragraph of this book, I was immediately ready for another dish of humor, charm, and Hurlihy fun. If you’re looking for the perfect novel to throw in your beach bag this summer, Must Love Dogs: Bark and Roll Forever is it. You will appreciate it even if you haven’t read books one through three, but I highly recommend starting from the beginning so that you don’t miss a bit of Sarah’s journey (or her father’s antics). You don’t even have to be a dog lover to love these books—but if you are a dog lover, you shouldn’t hesitate. Horatio the Greyhound/Yorkie mix will not let you down. Must Love Dogs: Bark and Roll Forever (with its all-too-adorable cover!) is available now on Amazon, Barnes & Noble or wherever you buy your books! Don’t miss any bookish fun! Like Book Perfume on Facebook and follow us on Twitter! We’ve got lots of summer reading ahead. Deb, you will LOVE it!!! It’s so hilarious and heartwarming…just what Claire does best!! Thank you so much for this fabulous review, Stephanie! And I’m so glad Riggins gave it his wag of approval! You’re very welcome, Claire!!! Congratulations on another WONDERFUL book!! So glad you’re looking forward to book 4 of the series, Deb! And no worries about mispelling my name—it’s easy to do!